Apple today updated its Mac recycling program to partner with a new company, replacing longtime partner PowerOn with Phobio, a company that promises a seamless device buyback program. Apple's recycling program is designed to offer Apple users cash for their old devices by providing simple trade-in options. Starting today, when you use Apple's Renew and Recycling program to recycle a Mac desktop or notebook, Apple will now direct you to Phobio's site where you can find your Mac by entering a serial number. After answering a couple of questions about condition, Phobio offers up a price estimate and lets users choose an Apple Store Gift Card, Paypal, or Virtual Visa Reward as a payment option. According to a source that spoke to MacRumors about the partnership change, Apple opted to go with Phobio because the site offers higher trade-in values, is easier to navigate, and provides an option for cash payments alongside Apple Store Gift Cards, something that wasn't available via PowerOn. Based on our testing, Phobio and PowerOn offer similar trade-in values for many machines, with PowerOn offering a slight edge in value for newer Macs, while Phobio seems to have slightly better pricing for some older models. Apple is only partnering with Phobio for Mac trade-ins at the current time. For PC trade-ins, Apple continues to work with PowerOn, and for iPad and iPhone trade-ins, Apple is still using longtime partner Brightstar. 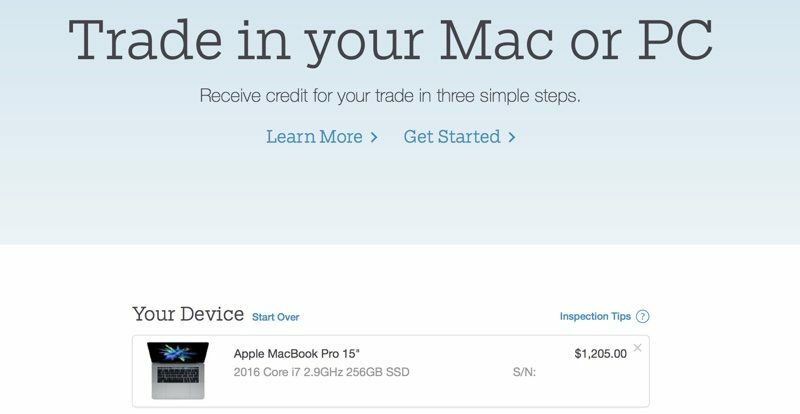 1200$ for a 15" 2016 rMBP. no thanks! Just sold my broken 2011 MBP to Gazelle for $150. Pretty good considering it's basically good for parts at this point. Apple was willing to give me $0 for it. I think we know who I went with. Here's my competitive buyback plan: I'll buy your MacBook Pro for $500 and sell it for $1500 on eBay. They sound like the GameStop of computer trade-ins. "What is that you got there? A fully specced out Mac Pro? I think we can give you $83.57 for that"
I read that as Phobia. The charger alone was $79 dlls, replaced it 4 months ago, what a joke. The amounts they offer are insanely low. I can't see going with them unless you just want to get rid of the old mac and be done with it as fast as possible. I never liked the trade in program. "I'm gonna buy the new imac pro...wait a minute. Why is my special inital on that screen? Didnt i trade in my imac 2011 with my inital on it?" I understand the ease appealing the people wanting to use these types of services, I would just rather deal with Craigslist and get more money.